Why are the stops so close together? Did the like once connect with the present day "D" branch of the green line? When was the last time a train rode the rails passed the current end of the line? The stops are close together now because the line is short so it can handle many stops while still being a very fast way downtown and because lots of pax live within walking distance of each station. The line is almost substituting for rapid transit (planned, never done). At least some of the stops were probably always close together because this was always mostly a commuter operation (Hersey and the Needhams) and/or because they date from the early days of the RR when stops were close together because the RR was providing local transportation (Roslindale-West Roxbury, old Boston and Providence Dedham line). Back in the days when trains were made out of wood, you could have really close stops, because lighter trains meant higher acceleration. On the Boston & Providence, there were stops approximately where each of the Orange Line stations is now. On the Boston & Worcester there were stations every mile inside the (now) 128 belt). What we now know as the Needham Line is a comglomeration of two separate railroads. 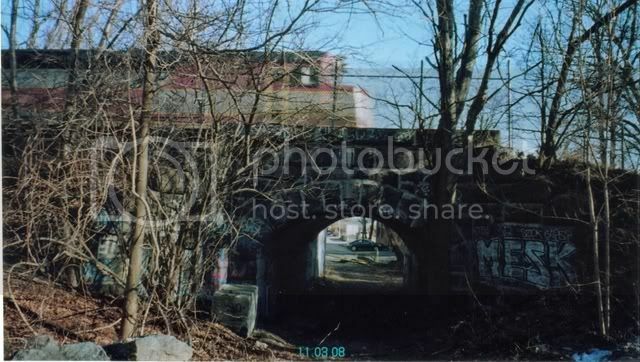 Built in 1850, the B&P's Dedham Branch (loop) (later New York & New England) split at Forest Hills, ran through West Roxbury to Temple Street, then turned south over a now-abandoned ROW, then turned east at Dedham and returned to the mainline (via an 1834 branch) at Readville. The Norfolk County later built a branch (now the Route 1 ROW) from Dedham to Islington to connect to their own railroad. Meanwhile, the Charles River Railroad was built from the B&A (ex-B&W)'s Brookline Branch (now the D line) to Newton Upper Falls in 1850 and to Needham in 1852. (Most of the gravel that they filled in the Back Bay area with was hauled from Needham over the CRR.) 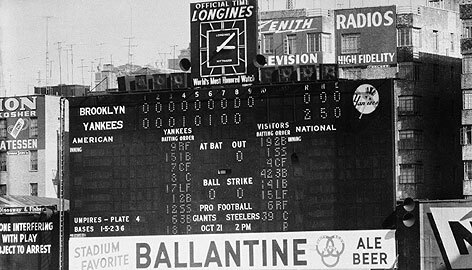 The NY&B later extended it southwest to Woonsocket and sold out to the NY&NE. The B&A bought the line to Cook Street Junction (just east of Eliot) in 1883 and extended to Highland Branch to Riverside as a loop service. In 1906, the NY&NE built the stretch from Needham Junction to West Roxbury so they could run their trains in on their West Roxbury Branch rather than over the B&A. I believe that ended passenger service over the Cook Street Junction, but I cannot say for sure. So, only in 1906 do we see the beginning of the modern service pattern: Needham, via Back Bay, Forest Hills, West Roxbury, and Needham Junction. Even then, though, most trains turned southwest at Needham Junction. Service that direction was discontinued in 1967. The Newton Upper Falls branch was used for industry until relatively recently, and rails are in place up to just a short distance from the D Line. The lines were disconnected at Cook Street Junction at least as early as 1946, although I believe a siding there may have been used by the MTA during construction in 1958-59 or even later. So, short answers: old lightweight wooden trains, yes, and probably 1906 for passenger service. Good responses guys. Eggey, that was great ! I'd only add to his post that a big advantage that was enjoyed by the steam locomotive was it's ability to start off at a brisk pace and get up to speed. During the transition years, company's liked the convenience of the diesels but they tried to find a diesel that would match this ability that the steamers had. You probably already know it, but the Needham Branch has an old history that predates both the MBTA and the Highland Branch ("D" Line). Any junction would have been a New York Central (Boston & Albany) junction on what is now the Highland Branch. The Boston & Providence, New England, and New Haven Railroads had set up their commuting lines with stations very close together. Just in Roslindale, there are two stations, about 3/4 mile apart, with two more in West Roxbury (there used to be more), about 1/3 of a mile apart. Both have a dominant station but three still carry their load. Did the ROW towards Dedham branch off around where Shaws/Star Market is now and run along Bell Ave towards the Dedham mall? If so, I've been looking for information on that ROW for a very long time. I grew up with that ROW literally in my backyard and could never find any information about ever. The junction was just a few feet westerly of the south end of Perham St. in between Perham and Temple Sts. The Needham branch still makes a jog towards the west there. Then down past Shaws, over the Spring St. Overpass, then paralleling Belle Ave. and eventually entering Dedham opposite Crosstown Ave. I believe that there are still tracks in the Toys R Us parking lot almost to the Dedham Mall lot in that fenced in area, however they are often covered by tall grass. The municipal parking lot in Dedham Center accross from CVS is where the railroad station was. There are tracks all around there, most if not all which are paved over, around the streets off Rte. 1 and some of the parking lots. In addition to the Rail's info, on the other side of rte 1 to that municipal parking lot, which would be on the eastern side of rte 1 north,there was a freight railhead. From what i remember, altho I never picked stuff up from there,it was just a concrete slab that railcars sided up to, and you could transfer the load to trucks. This area is just a grassy field that I can detect from G Earth. From this railhead, the tracks went south, across the little stub of Eastern ave,to an oil company miniture terminal, Churchill Oil if i recall right.This was basically right off rte ! give or take 100'. not sure if the tracks continued south from the oil company, if this was a spur , doubled track , or what.The memory is rusty from here. Isn't there still one of those massive stone abutments on Spring Street? Right across from the Shaws? Yes; Street View shows a pair of large abutments on the south side of the street. Nice pic Paul, do you happen to know where that is? Yesiree- I took the pic a few years ago. 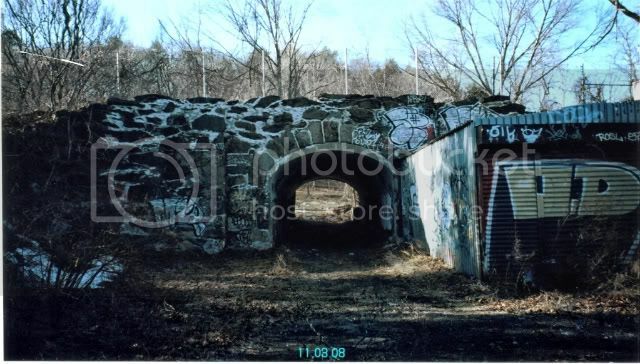 In the photo above, we're standing in the Arnold Arboretum "Daisy Field" and looking easterly at the granite overpass/subway towards Arboretum Road in Roslindale on the Needham Branch. This is how we entered the Arboretum when I was growing up, walking in through the subway, then turning right and walking up towards the South Street Gate. This is the companion overpass to the infamous Bussey Bridge, the scene of a terrible 1887 train wreck, about 1/4 mile south. Here's a photo looking from the other (Arboretum Road) side. That's an ancient blacksmith shop boarded up on the right. Sorry for failing to include the location the first time around. Nice job getting it from both sides. Have gone under just as a trains passes over? Id imagine it would be pretty loud since passing under bridges with a train going over it is pretty loud. Teamdrive in that goggle earth pic, the municipal parking lot I think ur talking about is on the west side of rt1. If anyone is confused rt1 is the road in the middle that goes from the bottom to the top of the pic while curving over a new bridge. West is to the left and east is to the right.